Children have held a steady interest in the Jurassic period's animal kingdom throughout the years and for good reason. Many fossils have been discovered of these fascinating creatures who once ruled our planet. Living around 156-145 million years ago, there are various renditions and interpretations of what the Brachiosaurus and the world that they lived in looked like. Other dinosaurs that lived in the Jurassic Period along with Brachiosaurus would be Archaeopteryx, Stegosaurus, Diplodocus and Allosaurus. Artist Josef Moravec captures the strength and grace, while at the same time keeping true to the scientific findings about this animal by paleontologists. His interpretations emanate a sense of realism and imagination simultaneously. In great detail, his oil renditions have become one of the most sought-after finds of that ancient world from the artistic community. This beautifully rendered Brachiosaurus art print brings the dinosaur back to life in scientifically accurate surroundings. 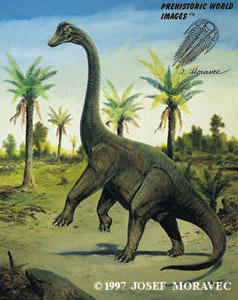 The most striking feature of Brachiosaurus is the long neck that stands 13 meters above the ground at the highest point. Known for its ability to see over the Jurassic kingdom with a view that could only be shared by those at much higher elevation, or with some form of wings, the Brachiosaurus pops out in the memories of young children and adults alike. Its reputation as one of the highest grazing animals in all living and prehistoric existence secures its place in history with a very distinct imagery in mind. In fact, the largest fully intact skeletal fossil that has ever been discovered belongs to this species of dinosaur. For those that share a love for the Jurassic period's animal life as an adult, or are just finding out about them as a child or student, Josef Moravec's work spans the spectrum between a scientific study and artistic interpretation in a way that appeals to everyone. Given the size of the renditions, it is sometimes easily forgotten that these animals actually grew to be about 85 feet in length from head to the end of the tail. If one shares a fond love for this particular dinosaur, there is no better way to bring it to life than to commemorate its existence with one of Moravec's art prints. Featured in many professional educational texts, the artist's work has become renowned for its ability to bring these animals to life in a way that only a true visionary artist can produce. This Brachiosaurus art print is part of a collection that will become a favorite for any dinosaur lover. Not only are they made available in quality production standards, but they also hold a bit of history that cannot be shared by any other class of animal in the world today. Bring this extinct animal back to life by allowing the work of this artist into your home or that of someone you know who shares the same admiration for these interpretations of ancient life. There probably isn't a boy alive who wouldn't love to have this work of dino art on their bedroom wall.